Another steppe people, the Avars, have dominated this region, and the Slavs have spread into lands previously inhabited by German tribes. Major population movements are occurring in this region. Central Europe is dominated by German and Sarmatian tribes. The rise and fall of the Huns has had a huge impact on this region. In the wake of the Huns, another nomadic people swept in from the steppes. These were the Avars. 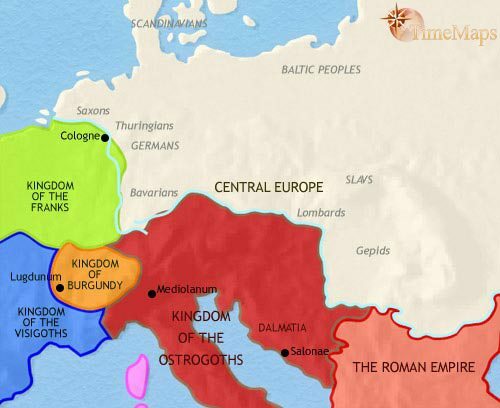 They established their rule over a wide area, destroyed the Gepids and pressured the Lombards into leaving their Danubian lands and invading Italy. Avar power has since declined, but they remain a strong power in the region. Slav tribes now inhabit the lands east of Elbe, which German peoples lived in until the period of the migrations into the Roman provinces. The German tribes in the Rhineland have largely come under Frankish rule, as have the Bavarians, who form a semi-independent enclave within the Frankish realm. These peoples have been converted to Christianity, coming within the spiritual orbit of the Catholic Church of western Europe. 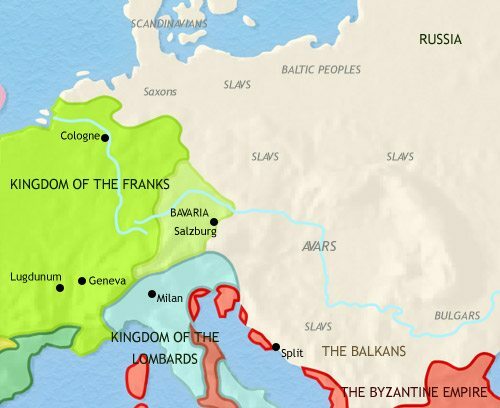 The Saxons are the main German tribe still beyond the reach of the Franks. They remain stubbornly pagan, and fiercely warlike. This region is seeing major population movements. The German peoples are expanding, moving outward in all directions from their homelands in northern Germany and southern Scandinavia. At the same time, Iranian people from the central Asian steppes, called the Sarmatians, are moving into Eastern Europe. 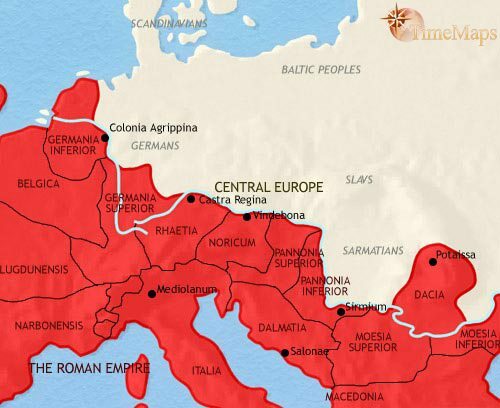 Central Europe beyond the Roman frontiers is now dominated by, on the one hand, Germanic peoples, notably the Goths, migrating in from the north; and on the other hand by the Sarmatians, an Iranian people who have moved in from the eastern steppes. The German tribes along the Roman frontier have experienced great changes in their way of life. Trade across the frontier has led to divergences in wealth within their previously egalitarian communities. At the same time, the constant military pressure – both from the Roman army in front of them and other German tribes pressing in from behind – has militarized their societies. Old tribal groups have vanished and new ones emerged, organized more on the lines of mobile armies than of the traditional tribe. These new formations are set to cause the Roman empire grave damage. This region, once dominated by the Goths and Sarmatians, was transformed by the coming of the Huns from the east. These were for a time the dominant group here. 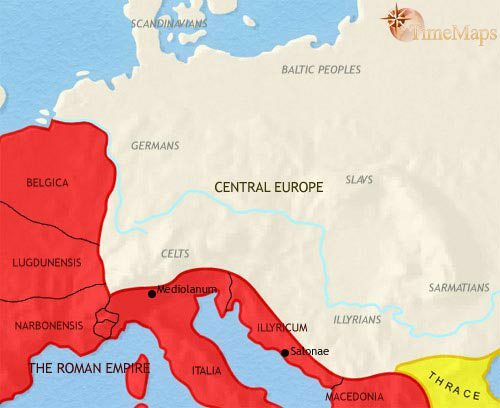 Their coming pushed the Geman tribes on the Roman frontier – Goths, Vandals, Suevi, Burgundians, Alemani, Franks – across en masse into Roman territory. Roman power in the west crumbled under this onslaught. Because of this great migration, German speakers ceased to be the majority group in central Europe during the 5th century. Other tribes were absorbed into the Hun confederacy or, accepting Hun overlordship, expanded into areas vacated by the Germans. A people belonging to one language group in particular, the Slavs, have expanded, and it is in this period that they begin to predominate in eastern Europe. Meanwhile, the Huns, after terrorizing the Roman empire for some years, have ceased to be a major power, and have in fact all but vanished, first weakened by internal squabbling and then disappearing amongst their former subjects.